Unless you’ve been living in a cave somewhere, you’ve almost certainly heard about Apple’s new iPad tablet. The $499 device is essentially a giant iPod Touch, but with a few additional features. The integrated ebook store (or iBooks, as Apple prefers to call them…) places the device as a competitor to the Kindle, and already they have the support of several major publishers. The form factor makes it perfect for sitting in a chair and reading, whether your content be an ebook or a web page. It also has a version of the iWork suite available that takes advantage of the touch interface. Already, there are predictions circulating that the device will be a miserable failure. I will tell you now, so we can all look back at this and decide who gets the last laugh, that my forecast is the opposite. Apple knows their market, and the iPad will sell. Why? Isn’t it just an iPod Touch that doesn’t fit in your pocket? At a glance, yes. However, each device has its own strengths — and the iPad’s give it a niche that will enable it to carve out a space between the laptop and the smartphone. It’s not meant to be a primary computer for most people. It’s a device that you keep in your living room to check IMDB while you watch TV, a device you use to read books in bed, a device you use to read the news in the morning, a device you use to watch movies on a plane. It’s primarily a media consumption device, a digital magazine, newspaper, and book rolled into one. I like to carry my iPod in my pocket, so I can hop on free WiFi hotspots and check in on my email and Twitter streams. It works wonderfully for web browsing, better than any device of comparable size, but the screen is small enough that it’s a pain to use for longer lengths of time. The iPad’s 10-inch screen is big enough that you could comfortably read longer articles on. With the “iBook Store,” Apple is obviously trying to place the device as a competitor to a Kindle. While the Kindle’s E-Ink display must be easier on the eyes than a backlit LCD, it’s still a one-trick pony. I think most people will see the iPad as a better value, since they get a full web browser and the ability to run iPhone apps in the same package. Apple redesigned the applications built-in to the iPhone to fit the new, larger display. In doing so, they made them that much more useful and easy to use. While the YouTube application on the iPhone is tuned to make video-watching possible on the small screen, the iPad version gives you a rich, full YouTube experience. The Calendar app is the same. 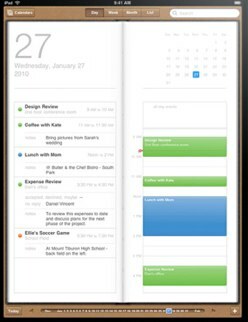 Rather than simply presenting your appointments in a way suited to fit in your palm, the iPad version gives you a full-blown planner look. The added screen real estate gives applications room to do more. I think we’ll soon start to see some killer applications developed specifically for this device. Can you imagine a touchscreen version of World of Warcraft? It seems like it would be a good candidate, game-wise. How about a MIDI sequencer, or a app/dock peripheral that turns it into a mixing board? I’m sure you can imagine an application that would be nothing short of spectacular on a large touchscreen. The iPad will certainly be big in the game market. Journalists who got their hands on it for a few minutes have said that the A4 processor is very fast, far snappier than the iPhone’s. Coupled with the large screen, there are so many opportunities waiting. Flight simulators, FPS games, whatever you like. Surely a high-resolution 1024×768 display would make them that much more impressive and detailed than you would get on a pocket-sized iPod. Some games would be more apt for the iPhone (e.g. bowling games and quick puzzles), but the iPad seems like a better fit for others. On the other end of the user spectrum, I think the iPad is a good device for those people who don’t really use computers. I’m sure you know someone who just reads their email, does some web browsing, and checks their Facebook feed. It seems like a good fit for them. The iPad is an interesting device with a market that’s not quite apparent yet. It will become clear in the coming months, though. 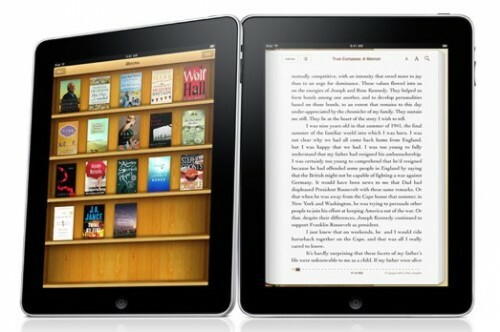 Between media consumption and yet-to-be-developed “killer apps,” the iPad will find its niche. I don’t think “find its niche” is the right phrase. People are complaining that it’s not “revolutionary.” Apparently, the only way it could have met that standard is if it accepted input telepathically or via direct connection to your central nervous system. The iPhone and the iPad are part of the same revolution – and guess what? The only player is Apple. Those who have tried to duplicate the iPhone’s success (Blackberry, Palm, Google) have failed because they think the revolution is about the hardware. It’s not. It’s not even just about a great “user experience” or the creation of a true lifestyle brand (of which Apple is the only one in the entire tech realm today). The revolution is about how we interact with the world – both real and virtual. People think that it was the interface that sold the iPhone. In reality it was the phone that sold the interface. Without the phone, the iPod Touch is just a niche device. (Remember the Newton?) Jobs was smart enough to realize that convergence was the Trojan Horse that would give the Apple revolution its next quantum leap of acceptance. And now that they have that bridgehead, Jobs is smart enough to realize that it’s multimedia that is the future. Funny how other people talk about that but – just as with phones – still manage to fail to realize what that actually means. Multimedia doesn’t mean a clunky device (eg: any laptop) that can do a lot of things separately and awkwardly. It means a single device that does media and the normal day-to-day activities of a wired world seamlessly and extremely well. I am by any definition a techie. I started programming using paper tape and toggle switches. I programmed for the Apple ][, bought the original Osborne I, used PCs since DOS 1.0, and can touch type 120 words a minute. But I don’t want to have to be a techie any more – and I don’t want to use a keyboard or a mouse the majority of the time. I want to relate to both the real and virtual worlds seamlessly. That’s the revolution – and that’s what the iPad lets us do. As for specific features, again, people don’t understand the Apple philosophy: everything should be a black box, and what ties those black boxes together is both a unified user experience and a unified control center called iTunes. (Talking about names – notice how stupid that sounds now that it has grown so far beyond music? Think anybody cares? It’s become a brand.) Both smart design and smart marketing. They also make sure to leave plenty of space for developers to target submarkets that actually do want some of those features – whether in software or hardware. Finally – Flash. Doesn’t anybody realize that Flash is obsolete? It was designed when (relatively speaking) bandwidth was at a premium while local processing power was plentiful. Today (again relatively speaking) the situation is reversed – and it will only continue to improve on the side of bandwidth. (There is an inverse relation between processing power and bandwidth: the more bandwidth you have, the less local processing you need.) Plus Flash is a proprietary technology that Apple doesn’t control. In a high-bandwidth world, HTML 5 can do everything that Flash can do – better – and as a universal standard. This is about Apple ensuring that it and it alone controls its own destiny – and if that means changing the established order – then the order is going to change. “Find its niche” is a little bit weak of a phrase to use, perhaps, but it does fir what I’m trying to get across – that the iPad is a product people don’t yet know they need. I give it a few months for developers to create some new apps that will make the device indispensable to the same people who hate on it 24/7. It’s niche will be a very large one – anyone who isn’t a techie or wants a content-consumption device for when they want a break from being one – but I still think it’s technically a niche device. It’s not something that will appeal universally.